Wai-nani was a joy to read! The action and sense of people and place builds with an authentic sense of ancient Hawaii. You have done an incredible amount of research! The interaction with the bottlenose dolphins is realistic for those of us who have developed an extraordinarily intimate relationship with them. I can certainly relate to feeling more freedom, embracement and joy in a water environment than a land based living! What a compelling story. Wai-nani's journey through the portion of Hawaiian history is truly an 'epic' tale in every sense of the word. So descriptively rich and sensually involving were the author's words that I found myself proceeding slowly through the pages, so as to savor, and the better to put myself in the skin of Wai-nani and her gripping transformations. So much of the description of Wai-nani's emotional evolution rang true as the way a woman's heart feels and expresses. Wai-nani's relationship with her dolphin friends was the cherry on the top for me in as much as dolphins are pretty much the center pole of my life. The author added fantastical elements to the human/dolphin relationships but, knowing dolphins as I have come to, what is portrayed in the story about the interactions hints at some very real possibilities as we go back and re-capture what cultures like old Hawaii still have to offer us. I just wanted to tell you how much I enjoyed it. The dolphin interaction scenes were delightful. You really made the historical time and place come alive with your vivid descriptions and good story-telling. You're an excellent writer and the book was a very fun read. the “best of the best” in travel writing and photography. “We were extremely pleased with this year’s (500) entries; they were outstanding, both in quality of work and range of coverage, “said Helen Hernandez, CEO of NATJA the second largest travel media association in North America. NATJA also publishes Travel World International Magazine. Learn more about Linda Ballou, featured author and her winning book Lost Angel Walkabout, in her interview to appear in the spring issue. 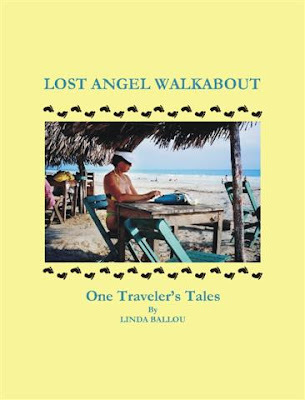 Linda Ballou shares highlights in her new book Lost Angel Walkabout filled with chills, spills, giggles, and squeaks, along with her secrets on "How to Make Travel Writing Work for You." Join her in this fun "Conversation with author Yolanda Renee" on blog talk radio. In the first part of my article, Get Ready for Good Times I talked about preparing your body for adventure. The second part continues with a few tips about developing a mindset that will allow you to enjoy your journey more. Please join me there for Get Ready for Good Times Part II at NAABW. Linda Ballou is the Adventure Travel Expert for the National Association of Baby Boomer Women. Author and Travel Writer Linda Ballou on Blog Talk Tadio Show "Conversations with Renée"
“Conversations with Renee,” is an interactive, live internet talk-radio show that focuses on authors and writers of all genres and mediums. Host Yolanda Renee explore the careers, advice, writing style and personality of each guest. Callers are encouraged (347) 215-9536 to listen or ask questions. The stream and archives are available at http://www.blogtalkradio.com/yolandarenee. There's nothing on this earth to be prized more than true frienships. Even when that friendship is between a dolphin and a dog. Let's be friends! If they can do it, then so can we. People who swim with dolphins often talk about the acceptance in the globelike eye of the Dolphin. 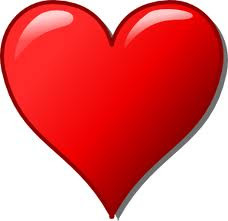 They feel a sense of a non-judge mental intelligence, even unconditional love. Great results from dolphin therapy with children who suffer from Down ’s syndrome, people with neurological disorders, autism, pain relief from spinal injuries, muscular paralysis and depression have been reported. Dolphin Therapy started in the early seventies. Dolphin therapy is not a cure, but it seems to help alleviate symptoms. Children are asked to swim, touch, feed or pat the animals. It is a happy playful time that produces a change in hormones, endorphins and enzymes. Sonar pulses from the dolphins help bring both sides of the brain into sync creating a heightened awareness and increased learning ability. There are about a dozen dolphin therapy centers around the globe. Florida and Hawaii have the most but they are also located in England, New Zealand and Israel. They are not cheap about $2000 a week, and results are not guaranteed. Still it is an exciting alternative medical approach to serious problems. One of the most exciting incidents in my life took place in the Sea of Cortez. I was kayaking up a deep, narrow channel when a pod of at least 100 dolphins came up behind me and swam all around me. The chuffing air puffing rhythmically from their blow holes as the arced with powerful grace in synchronicity all around me for about fifteen minutes was incredibly exciting. For a few fleeting moments I was a part of the pod. It gave me the real sense of a connection with the natural world. They soon were gone and off to a party I wasn’t invited to, but I will always cherish that incident. There is a big difference in swimming with captive trained dolphins then an encounter with those in the wild. In captive situations with dolphins that are trained and used to interacting with humans people enjoy a much more intimate contact. At the Kiwalo Basin Marine Lab in Hawaii, Lou Herman has been training and testing dolphins for decades. He has learned that they are great mimics. If you roll over in the water they will. Even if you are not in the water they will take directions by imitating your movements. He has not broken the Rosetta code of their language, of clicks and bleats, but he is definitely communicating with them with hand and verbal signals. 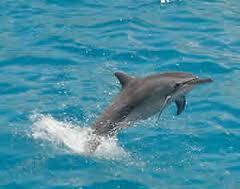 He has found that dolphins are highly adaptable and clever. They will admire themselves in mirrors indicating self-awareness. They can understand numerous hand and voice signals and have cognitive skills that are much more advanced than even the chimp. There are 2,000 different sentences that they understand and will respond too. They also have their own language! Bleeps, whistles, clicks make up a constant conversation they have with one another. Each dolphin has his own identifying whistle, just as we have a name. Their language is not just made of words it is made of touch and they intuit a good deal in their tribal interactions. Consider this . . . Man is the dream of the dolphin . . . the "other Intelligience" may be in charge . . . not us. 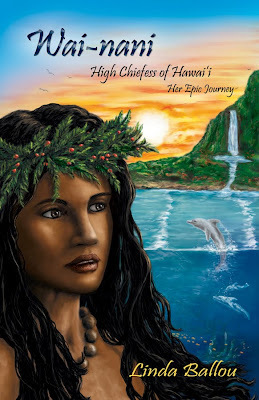 In an attempt to make the interaction between Wai-nani, and her dolphin friend Eku, in my historical novel Wai-nani High Chiefess of Hawai’i, I learned a lot about these enigmatic creatures. Wai-nani spends half of her life in the ocean, so it did not seem far-fetched that she would make friends with playful marine mammals. Eku rescues her from drowning when she is about ten. Dolphin rescues are on record since the time of the Ancient Greece. If they see a human drifting into a vertical position they will lift them to the surface to prevent drowning. She begins a communication with him with clicks and whistles and they form a bond. She rubs his tender belly making him tremble with delight. He in turn gives her a massage of sonic blasts that cause her to tingle all over. As recently as 2007 a surfer in Monterey CA was being attacked by a shark and a pod of dolphin formed a protective ring around the man and drove off the shark. Our kinship with the dolphins is greater than with any other sea creature. They are warm-blooded mammals who nurse their young and must breathe air. Unlike us their breathing is not automatic. If they loose consciousness they will drown. While swimming after a dolphin in the waters off the Big Island, I ran into the “Dolphin People.” They are a group who follow dolphin movements around the Islands in an attempt to make spiritual connections with them. There is a very large need it seems to make contact with this “other intelligence.” Anthropologist, Loren Eisley, calls it the yearning to end great loneliness of the human species....why go to Mars when the mystery of an alien intelligence is with us and it is in a pleasing, graceful energetic body. This video called The Dream depicts the universal appeal of dolphin and how we have tried to connect with their energy and spirit. Your comments about your own dolphin encounters are welcome. 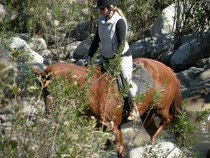 If you enjoy a well-mannered, fit horse with a private guide instead of the usual nose-to-tail walk offered at most stables, you will love the two-hour forest ride with Ojai Valley Trail Rides. You can trot and canter along when your guide gives the cue that the footing is safe. Ojai Trails is located at the edge of the open space of the Ventura River Preserve. You can also hike the miles of trails that meander through the oak canopy that shades Wills and Rice Creeks up to crest lines with majestic views of the surrounding Topotopo Mountains. In spring a dazzling display of wildflowers brighten the pockets of grasslands and meadows along the way. Adventurer Susan Alcorn gives Lost Angel Thumbs Up! We both love to hike and share our favorite outings with other outdoor enthusiasts. Beautifully descriptive passages, inspiring adventures, and reminders of the bounty of nature combine to make Lost Angel Walkabout an intriguing read. 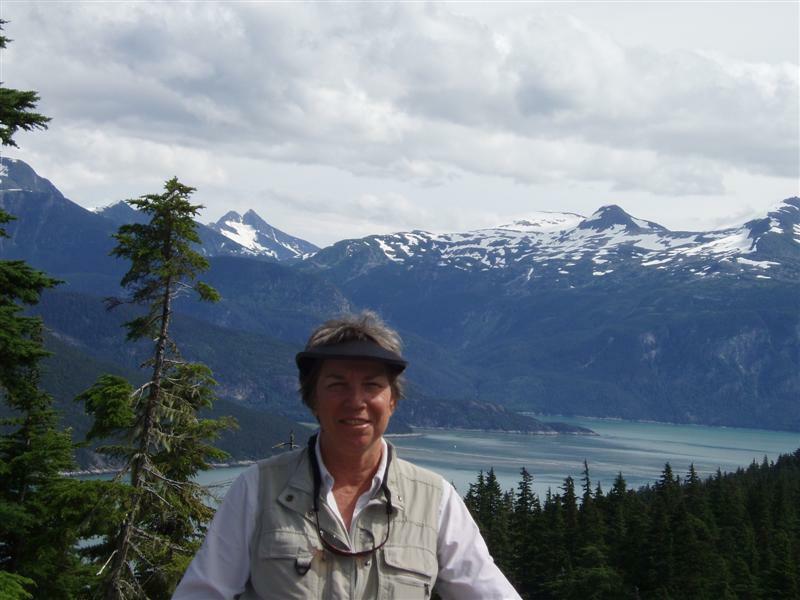 Author Linda Ballou's stories of adventure will leave you breathless. In this fascinating collection of trips she's taken far and wide, she not only goes horseback riding on perilous cliff side trails in Ireland, but also learns how to jump fences. On the Green River near Moab, Utah and the Salmon River of Idaho, she starts out on kayak trips that she thinks will be mostly a serene glide. Sometimes it is peaceful and idyllic, other times... "I found myself flying out of my boat and falling into the center of a six-foot hole." As in most of her tales, Ballou emerges from her experience -- in this case being hurtled downstream in the Salmon River -- feeling stronger and even more courageous. Note of disclosure: I received Lost Angel Walkabout as a review copy with the option of reviewing it if I was so inclined. I was happy to be able to give it a 5-star review. I am also a travel writer and share Ballou's love of adventure and the outdoors. She does not travel as a tourist, she travels as an adventurer seeking to immerse herself in the culture and surroundings of her destination.